Mark Mikelat, book coach, is proud to celebrate the 1-st year anniversary of his client’s book Never Alone by Gayle Garcia. Los Angeles, CA – 05/01/2016 Mark Mikelat, is the author of multiple books and he coaches speakers, trainers, coaches, and entrepreneurs how to share their message with the world in a book. After a fifteen-year struggle to help her son recover from addiction, Gayle Garcia reveals the story of a Mother’s unrelenting love. 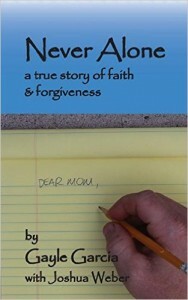 In this collection of letters, Gayle and her son Joshua communicate while he is incarcerated for driving under the influence. Families walk a tortuously thin line when a loved one is battling addiction. Gayle continually questioned her parenting skills: Did she forgive when she should have shown tough love? Never Alone proves there is no wasted time when you walk with God. Though her son is locked up, he is actually becoming free from the addiction and behaviors that put him there. As you read this true story, you will realize that even in Joshua’s darkest moments, he is never alone. Gayle and Joshua’s journey of faith and forgiveness speaks more to hope and redemption than to the heart-breaking circumstances.